Palestinian women have long been a part of the political tapestry. 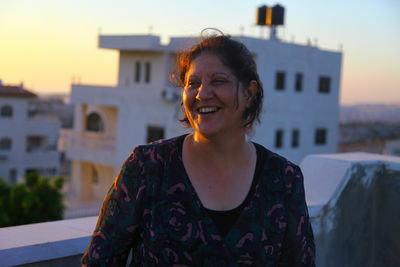 Naturals at organizing and fulfilling the needs and requirements of society, Palestinian women have excelled in politics. Elham Hamad (right) and Suhair Saleh (left) work together at the all female political party "Binet al Balad" in the town of Safa in the West Bank. Together, they work for women's rights in their region. Elham Hamad, who works at the all female political party from Safa, "Binet al Balad". Suhair Saleh and female politicians from other regions of the West Bank are attending a workshop organized by the NGO MIFTAH (The Palestinian Initiative for the Promotion of Global Dialogue and Democracy), to organize their campaign for the up coming elections. 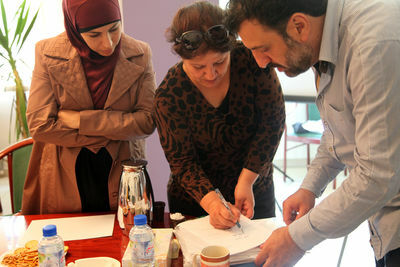 Members of the "Binet al Balad" party working with a male consultant to organize their political campaign. 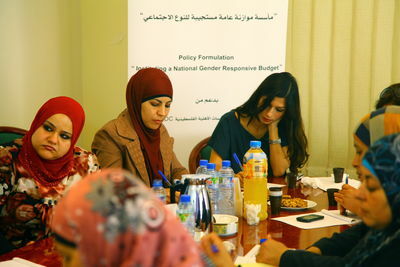 Suhair Saleh (left), Elham Hamad (center) et Shams Karajah (right) discuss about their strategy and political campaign for the up coming elections.